Spanish Flu (1918-1920) - Next to the Black Death outbreak of the Middle Ages, the 1918 flu pandemic was the deadliest in world history (in shear numbers, but not necessarily as a percentage of population). It broke out near the end of World War I and killed at least 50 million humans worldwide, or about three to five times as many as the war. 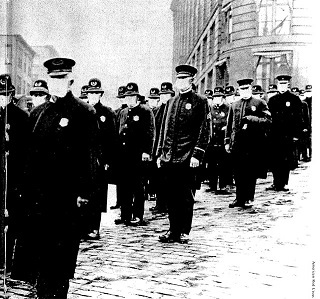 Though named "Spanish" flu, the virus probably originated in the trenches of Europe. But the war nations intentionally suppressed the death toll in order to maintain morale. Spain was neutral and there was no need to hide the impact from the public giving the impression that Spain was hardest hit, thus lending its name to the pandemic.